Private sector organizations can decide to scrap existing systems and start fresh in an area – but this is not typical in government organizations. Governments typically change more slowly and deliberately because they are serving ALL of the public, so they must maintain existing systems, even if they serve a shrinking or already small populace. As a result, backward compatibility to existing systems is of critical importance. Legacy constraints include existing processes and systems, organizations, and relationships. The idea is that, for a variety of reasons, it is easy to turn a motorboat but infinitely harder to turn a ship. 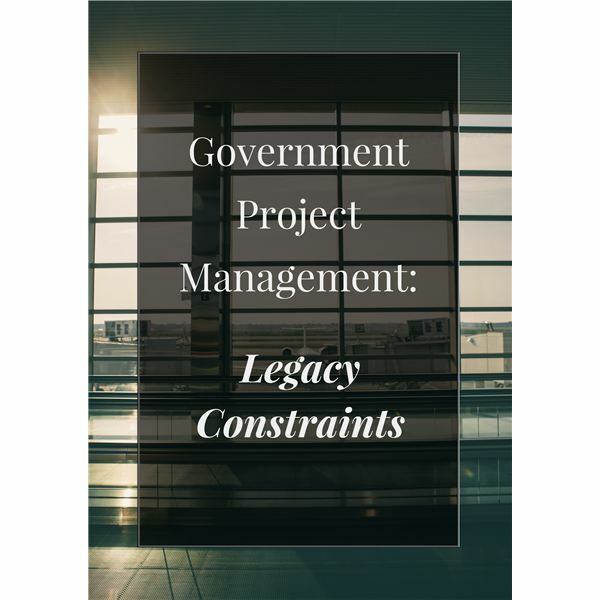 Following are some areas where legacy constraints have an impact on government projects. Change is not easy, and the mere existence of legacy ways of doing things is an obstacle. More than in industry, systems can become greatly embedded in government environments. At the same time, government organizations need to progress, and that takes changes eventually. Accommodating existing systems is one of the things that increases the complexity and cost and limits the speed of change. Existing programs are key stakeholders in most new programs, especially those that provide a solution than is a common thread across programs. Existing programs typically have a charter, budget and substantial organization already in place and doing business. Links to legacy organizations and their way of doing business are a key constraint to a new project or program. Starting a project is easier than finishing it. It’s typical on projects to be starry eyed at the beginning, only to have dampened hopes once reality sets in. In private industry, it can be easier to kill a sub-par program. However, in government, with a lower financial incentive and greater organizational inertia, it’s not so easy. Dealing with such laggard programs as stakeholders can be an especially difficult challenge. The larger the organization, the more difficult it is to pin accountability on an individual or small group. The bureaucracy weaves a complex web of influencers together – so much so that it can often be difficult to identify anyone directly accountable. To make matters worse, it is often difficult to get a clear and honest picture of whether a project is a success or a failure! What are some ways that you have employed to deal with legacy constraints on government projects?